It has been three months since I did a Fritz update! He is doing awesome! We had his second MRI this last month and we got great news back. The fluid around his brain has gone down, his ventricles are still increased in size, but they believe this is just his anatomy (not hydrocephalus) and his cyst is stable in size. He is meeting all of his developmental milestones and everyone, including us, feels really confident that Fritz will be just fine. We go back into Neurology in six months and will do another MRI when Fritz is two! We are so thrilled that the diagnosis of Mega Cisterna Magna was incorrect and that we no longer have to worry about Dandy Walker. I’m so thankful for those that have reached out via email, Facebook or Instagram with their own stories. It is SUCH a scary time. After days later we took Fritz to visit my sister in Salt Lake City. We totally lucked out on the flight out there and had the entire row to ourselves. Fritz slept and was such a good baby. One of the biggest compliments is when people tell you your child is so well behaved or mention they didn’t know a toddler was on the flight. On the way home he was a bit more rumbustious, but the people around us were so sweet. We loved staying at Kate and Billy’s beautiful new house. It was so cozy and my sister has such an eye for detail. I feel in love with SLC. I mean…you walk out of Target and get to see beautiful mountains surrounding you. We went up to Park City for the day and it was a blast. Next time I am definitely snowboarding. Did you know I’ve been snowboarding since fourth grade…and I’m actually good!!!?? This week has been packed with travel for us. I came home from Chicago last week to Fritz taking his first steps! We are working on balance, but he is doing so well and is becoming fearless. This month I am really focused on learning with him. I ordered flash cards and we are DONE with bottles. He currently only has his two bottom teeth, but his FOUR front top teeth are all coming in.Fritz will eat anything and last night I got him a Chik-fil-a kid’s meal and chocolate milk. YUM. This weekend my mom and MIL are coming to watch Fritz. They asked to have a weekend with him and Adam and I were totally up for it. I can’t wait to see how much fun they have! We went in at 38 weeks and three days to have an ultrasound done, specifically, of Fritz's brain. They wanted to see if the space they noticed 10 weeks earlier hard grown and if there were any other visible issues. Said space had grown, but Fritz looked perfectly healthy otherwise. "A moving baby is a happy baby," our doctor would say over and over. Immediately after I had a checkup with my OB. Adam and I had gone to triage a few days earlier when I woke up for work and noticed a lack of fetal movement. The resident noticed I had low fluid, but all looked great in the ultrasound. Aside from Fritz's Mega Cisterna Magna, we went to the appointment pretty happy. It was routine, they took my BP, which had been high at three out of 20+ prenatal appointments. Out came, "OH F***", " at the poor nurse, which is when we all knew they would be sending me over to triage to be monitored. Adam and I both thought maybe it was a fluke. My BP had been high the week before due to stress, but I got it down by doing breathing exercises. I swear by this: six breaths in - hold six breaths - six breaths out (works miracles). Instead of monitoring me for the standard three hours, they waited about thirty minutes to tell me I was going to be induced. When anyone asked me my birth plan, I: 1. was convinced I would have a c-section 2. didn't care how the baby got out as long as the baby and I were both healthy. 3. really did NOT want to be induced. 4. was VERY concerned about screaming and pushing (like in the movies). 5. planned on having my hospital bag with me when I was checked in - - - ha. After being induced on Tuesday, we met our beautiful boy on the evening of Thursday, January 25th. Fritz was deemed a "stunned baby". He just wasn't quite ready to be in this world, but Adam and I were in awe. He was perfect, even if he didn't want to meet us right then and there. We were so smitten, so in love, he was here, finally. Fritz had the sweetest round face, almond eyes like mine, and a tiny bit of dark hair. He had two dimples and a sweet dimpled chin. He was the tiniest thing I had ever seen. I couldn't believe he was ours, to keep, forever. A few hours passed and we had a very lethargic baby with us in our recovery room. Adam's mom and dad came to meet Fritz and he didn't make a peep. This seemed normal to me, he was just chill. One of the nurses decided to test his blood sugar, not something that was routine, and it was alarming how low it was. Fritz was admitted into the Special Care Nursery at Mayo Clinic (a step down from the NICU) and one of the most special places I've ever been. He was hooked up to an IV with the equivalent of sugar water and was tested every few hours to make sure he was on the mend (this is pretty standard). I will never forget the nurses sticking his tiny feet and being so unhappy with his IV placement. They hated the new "prickers" that Mayo had ordered and poor Fritter kept bleeding and bleeding. These nurses cared so much, I think about them every day. We also learned that Fritz's bilirubin was also super high, something that can happen if the baby sustains 's bruising during the birthing process, due to let's just say...pushing (again, this is pretty standard and happens all the time). This was a punch in the gut. We thought we could maybe take him home on Saturday or Sunday, but he needed to be under lights for 72-hours at a minimum and then they would test him again. If his levels didn't improve, it meant we had six more days in the hospital. Searching for any positivity we could find, Fritz loved the lights and the goggles. Apparently, this is rare, so GO FRITZ! We called him bug when he was first born for a reason. While we were in the Special Care Nursery, we could also work on getting some more answers about this sweet babe's noggin. They did an Ultrasound of Fritz's head and sat me down later that day with the results, Adam had run over to the gym and I told him to come back. What they found were enlarged ventricles, mega cisterna magna and some plexus cysts on his cord. All separate are usually benign, but together meant that we could be looking at other significant health issues - they were worried about his kidneys, lungs, and heart now. The team thought that since they were seeing these issues in his brain, that surely something else had to show up in another part of his body. Typically these kinds of diagnoses don't come alone and are followed by other issues. The next recommendation was a full genetic workup, which was done when we were in the hospital and a consult with Neurology after we were discharged later the next week. Mostly, it was a waiting game, until Fritz was four weeks. Neurology ordered an MRI (tubed and sedated) for our one-month-old baby. Adam and I weren't quite ready to put our four-week-old under anesthesia, so we meet with Dr. B instead to see if they could look him over first and see what we saw - a thriving little boy. At four weeks old Fritz had his first Neurology appointment. It is here that we found out his genetic panel came back perfect and that his head was in the 99.9% range. His muscle tone looked great which was a good indicator that Dandy-Walker might be off the table, but the growth rate of his head was concerning. At four weeks old we couldn't really establish indicators of a developmental delay. Neurology said we could put off the MRI, but ordered another Ultrasound and monthly head measures. Adam and I were still in a gray area here. We were crushed because in front of us was this perfect baby. He looked perfect, smelled perfect, acted perfect, but we were being told over and over and over again that he was far from it. On top of that we were also getting mixed messages. At the end of our first neurology appointment, the consultant came into the room and spoke the kindest words that would carry us through the next five months, "Sometimes we make a big deal out of nothing and I hope that is what we are doing here. Sometimes you just have to look at a baby and say, my my, that is one beautiful baby. Your baby will be fine." The next few months looked like this: well-child exam, head measure, his head grows, doctor's freak out. I would freak out that his head is growing at an alarming rate and that he did have hydrocephalus and I was just missing it. I checked his soft spot for pulsing every hour - maybe more. When our doctors would order an ultrasound, the ultrasound looked good - over and over and over. 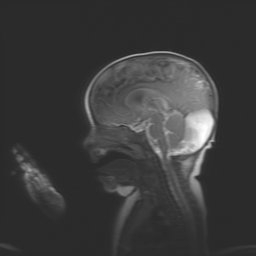 His head was big, his ventricles shrunk (this was a huge relief as when they are enlarged is a sign of hydrocephalus) and the cysts on his cord did not increase in size. At about five months they finally said we could do a non-sedated MRI to get a good look at the back of Fritz's brain. The week leading up to his MRI was undoubtedly the toughest of my life. I was hit out of the blue with crippling PPD and Anxiety. ***Right now, I'm taking it day by day, but do feel much better, thanks to the miracle of modern medicine and a husband who was able to get me into the doctor ASAP. Fritz's MRI was on a Tuesday. Adam was able to leave the OR to support me as we put our baby in a giant white tube. Surprise: one of us had to go in with him. I volunteered and held down my sweet, screaming Fritter for what felt like an eternity. They got all of the photos they needed and again, we waited. As I pulled in our driveway after picking Fritz up from daycare on Wednesday my phone rang with a Mayo Clinic number is was Dr. B. It must has been fate because as I opened the garage door Adam was standing on the stairs in the garage, I think he was taking the recycling out. I made hand gestures, like "ITS THE CALL!!!!" and he just sort of stared at me until I started literally fist pumping for joy. It was good news, great news, the best news I've ever gotten in my entire life. Fritz had: macrocephaly ( a big head) and a benign arachnoid cyst. This is a common type of cyst, in fact, people we know (really smart and successful) people have them (ha!). Our Fritz hasn't mastered sitting up yet, but his head is H U G E. And for the record Adam and I both aren't on the adult growth curve for our heads either, we also have H U G E heads. Our next Neurology appointment is on August 29th! We are expecting good news. We don't take for granted that we have access to some of the best medical care in the world here in Rochester. I also know, that our story, unlike many others ends happily. For that we are so fortunate and not a day goes by that we don't acknowledge it.